Support was provided by the University of Arkansas Bookstore, which donated items for prizes, and by Leadership Walton, whose students volunteered to help staff the event. Contestants were Walton College students who were currently enrolled in a public speaking course (COMM 1313). The competition had three rounds, including the finals, and each student delivered a six- to eight-minute persuasive speech. Contestants’ speeches advocated a solution to a problem faced by Northwest Arkansans, and the speech topics varied widely from water conservation to law enforcement to airline safety. This competition provides students with the opportunity to practice presentation skills in front of a live audience and also rewards students who deliver excellent speeches. 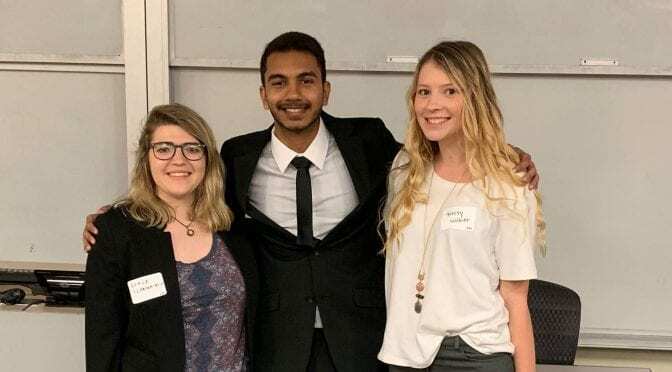 Students benefit by improving their public speaking skills and the university community benefits by hearing the solutions that students advocate. Sai Vanteru delivered the winning speech, receiving a $400 bookstore gift card; Grace Scognamilio came in second, winning $250 in bookstore merchandise; Trinity Walker placed third, receiving a $100 bookstore gift card. Kiara Lozano-Santiago, Grace Crain and Rebecca Carroll also presented in the final round. Special judges for the final round were Lynn Meade, Department of Communication; Diana Brown, director of production at the Walton Arts Center; and Aidan Smith, a Walton sophomore marketing major who was last year’s winner. Details on the event can be found by visiting its webpage.